Trending News!!! There Shall Be No More War In Nigeria Bishop OyedepoProphesies Today! - You Are A Genius You Are A Genius: Trending News!!! There Shall Be No More War In Nigeria Bishop OyedepoProphesies Today! Trending News!!! There Shall Be No More War In Nigeria Bishop OyedepoProphesies Today! During the one night with the King first night, today is Friday, the first night on the 21 days fasting and prayer night which started on the 8th of January 2018 and will be ending on the 28th January 2028. 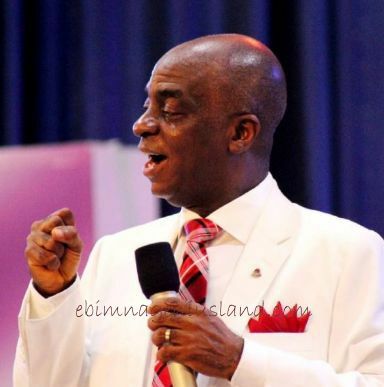 Bishop Oyedepo prophesied that there will be no more war in Nigeria. He also said that The Lord revealed it to Him in the year 1992 which he documented and this day was the day it was revealed. He went on in an angry spirit praying against the Fulani herd's men, who are brutalizing the children Of God in Benue State, HE declared that there will no such news heard in the country anymore in Jesus name; Amen. On the Altar of the declaration, he encouraged the congregation who were present on the program, that they should stand on their feet and be for Christs if they are for Christ. He went on saying that, no matter any plans or attempt the Muslims to stop Christian Religious knowledge in any school in Nigeria, they will not succeed and if they try to, the anger of God shall come upon then with a great wrath of destruction. The reason is that the gospel of God can never be stopped, no matter how hard they try to or how desperate they seem to be in the destruction of the Christianity in any ways or strategies at all. When God created the world, He instituted the world for His reigning alone, and if any man that was created By Him will Raise against Him, then the man will end up like Sodom and Gomorrah. When most people are busy thinking of evil they will do against the people of the Highest, Then, God is already there waiting for the manifestations of His own plan, because He is a master planner. No matter how arrogant the enemies claim to be whenever they see the people of the Highest, They will be surprised at the results of their plans which will automatically fall upon their own heads, as a mode back to the sender.